ST. LOUIS -- Melody Ping never thought she would be trying to move out of a nursing home. She lived in a St. Louis apartment for 19 years and worked as an accountant until two years ago, when she lost her job. Ping, who has multiple sclerosis, couldn't find new work. When her unemployment ran out, she ended up on Medicaid in a nursing home. 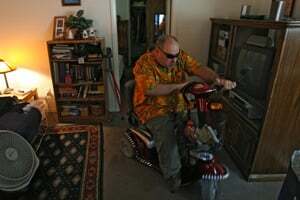 Ping, 51, is among tens of thousands of people nationwide who want to live on their own, but instead remain in nursing homes, rehab centers or state hospitals, often at a higher cost to taxpayers because of a historic bias toward institutional care. Ten years ago today, the U.S. Supreme Court said that bias amounted to discrimination. Now, as disability advocates celebrate the anniversary of that landmark ruling, they worry the Obama administration is backing away from a pledge to give more people with disabilities the option to live at home. As a senator, Barack Obama co-sponsored the Community Choice Act, pending legislation that would give Medicaid recipients equal access to services in the community and not force them into institutions. But the administration recently said it would not address the issue as part of its proposed health care overhaul. Disability rights advocates were so angered that at least 90 were arrested during an April protest outside the White House. For some, the dispute was a blunt reminder of how hard it has been to put an end to discrimination even with affirmation from the Supreme Court. "I don't think most policymakers see it as a civil rights issue," said Andrew Imparato, president of the American Association of People with Disabilities. "I don't think most people see the ability of getting out of bed and dressing in your own home as a civil right." A spokesman said President Obama continues to support efforts to help people with disabilities move out of nursing homes. About one in five nursing home residents responding to a survey by the Centers for Medicare and Medicaid Services indicated they would prefer to live in their communities. That translates to 270,000 of the nation's 1.35 million nursing home residents. Demand for community services is likely to mushroom in coming decades. Improvements in medical technology help more people survive serious injuries, but often with a disability. Baby boomers entering their retirement years are demanding alternatives to nursing homes. "If you can't hear the thunderstorm coming, you're not listening," said disability advocate Mark Johnson of Atlanta. Living at home "is what people would want for themselves and their families." That was the motive for the Olmstead case -- named for defendant Tommy Olmstead, Georgia's human services commissioner when the case was brought by two mentally disabled women, Elaine Wilson and Lois Curtis. They said they were segregated unnecessarily in a state hospital, and that with proper support, they could live at home. The Supreme Court ruled that funding services for Medicaid recipients only in institutions violated the Americans with Disabilities Act. The decision touched off a wave of hope. The U.S. Department of Health and Human Services recommended that state Medicaid directors draft plans for helping people who wanted to move out of institutions. Twenty-nine states produced plans, but few resulted in actual changes. Many are now out of date. Nationally in 2007, more than 331,000 people were on waiting lists for community services. About two-thirds have developmental disabilities, and the rest have other disabilities or are elderly. In Missouri, where about 48,000 people live in institutions, including nursing homes, about 45 percent of the state's Medicaid long-term spending goes to home services. About 4,000 people are on a waiting list for community services -- most are developmentally disabled people, some who do not live in institutions. In Illinois, which has at least 97,000 people in nursing homes and other institutions, about 30 percent of Medicaid long-term spending goes to community services. Disability activists in that state worry that the current budget shortfall may force more people into institutions. Disability advocates blame the slow progress on opposition from the multibillion-dollar nursing home industry and from unions that represent state institution workers. Also, many states have been unwilling to alter budget structures that favor institutions. The American Federation of State, County and Municipal Employees has declined requests by disability groups to endorse the Community Choice Act, which it worries could cost the union's members jobs. The American Health Care Association has never taken an official position on the act, said Susan Feeney, a spokeswoman for the organization representing the nursing home industry. "We do support the ability for individuals with disabilities to receive the care they need in the most integrated setting." But industry groups have opposed measures to make community services mandatory, saying they could jeopardize funding for people who need nursing home services. "It's difficult to bring about a cultural change," said Stephen Gold, a Philadelphia lawyer who has handled dozens of lawsuits for people seeking to move out of institutions. "It's like a big ship, and we're slowly turning it." More than 140 lawsuits have been brought across the country. While many led to individuals leaving institutions, they haven't always changed state Medicaid programs. Missouri was among the first states to allow Medicaid funding to follow a resident who leaves a nursing home. Federal grants and pilot efforts have encouraged similar policies. Two obstacles tend to stand in the way of people like Ping: They cannot get or find the services they would need at home, such as an attendant to help them get out of bed, dress or bathe. And they cannot find affordable, accessible housing, which is in short supply. In St. Louis, the waiting list for low-income housing vouchers is "closed indefinitely." And housing options in other Missouri cities can be hard to come by. Peter Lloyd of St. Charles knows how much harder it is to move out of a nursing home than into one. He landed there after being hospitalized by an infection and spent more than a year arranging for services so he could move to his own apartment. "I needed to be around younger people in the same situation," said the 44-year-old Lloyd, who has cerebral palsy. "None of the activities are geared for people my age. How many times a week can you play bingo?" After months of paperwork and phone calls, he got an apartment through the St. Charles County Housing Authority. He also got funding for an aide to help him wash, dress and cook. Seven years later, Lloyd is really on his own. He no longer needs a personal attendant. He drives a van, adapted for his power scooter, to St. Charles Community College, where he is pursuing a degree in English. On the weekends, Lloyd drives to Chesterfield, where he works for a computer help desk. But the chances of making a transition like Lloyd's vary widely from state to state. In Tennessee, only 1 percent of Medicaid long-term funds for disabled and elderly adults went to community services in 2007. By contrast, Arizona spends 64 percent of Medicaid long-term care money on community services. Disability advocates argue that real progress won't come until more is done to keep people at home. They have pinned their hopes on the Community Choice Act. Similar bills have come before Congress for at least a decade. As a senator, Obama cosponsored the bill in 2007. But for now, long-term care is not part of his health care reforms. White House officials cited cost as the reason in a meeting with disability advocates in April. Obama's staff wouldn't say what his current position is on making community programs mandatory. The White House Web site had said Obama would support the Community Choice Act. Recently, the site was changed to say he would "build on existing efforts to encourage states to shift more of their services away from institutions." Disability advocates say that letting more people have services at home will save money, one of Obama's goals in health care reform. The average annual cost of a nursing home nationally is about $75,000, according to a recent study by AARP. Community services that allow people to remain at home are about $23,000 a year, according to an analysis of Medicaid data by the Center for Personal Assistance Services at the University of California, San Francisco. Critics warn that even if costs are lower in individual cases, overall costs will rise because more people with disabilities will request services if they are available. In Texas, where 18,000 people have moved from nursing homes since 2001, officials say they have seen the savings firsthand. "It certainly does not cost more," said Marc Gold, a state official who directs the Texas Promoting Independence Program. Chris Hilderbrant, of the Center for Disability Rights, said Obama and congressional leaders are missing an opportunity to fix a long-standing injustice. Once again, people with disabilities are left on the sidelines, he said. "We're going to get to you later," Hilderbrant said, "means we're going to get to you never." In St. Louis, Melody Ping is still waiting in a nursing home, longing for a return to apartment life, where she likely will need an attendant to help her. "I'm used to making my own choices," Ping said. "Here, they tell you when to get up and when to eat."